Trance producer and DJ from Republic of Moldova. He’s the modern day Mozart, today’s leading talent in the ever-growing trance scene. He’s the pride of Moldova, known for his unique and very own sound. 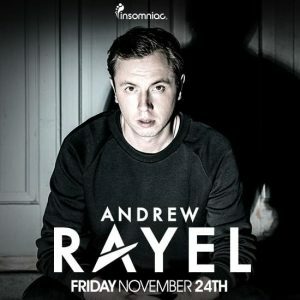 He is Andrei Rata, better known as Andrew Rayel. Born on July 21st, 1992, his young age never stopped him from taking the lead in the next generation of EDM producers. Developing strong musical skills, he studied orchestral music and kicked off his producing career at only 13 years of age. It didn’t take long for the passionate music lover to translate his ideas into sounds. He created a truly unique, significant sound, one of piano power, harmonic balance and euphoric tales. And so, years later, his originals and remixes are praised by many and loved by more. But, rest assured, the Andrew Rayel story has only just started. “Trance was the perfect solution as it is an combination of melody, harmony and energy, elements that I prefer the most.” says Andrew Rayel. Often called ‘the new Armin van Buuren’, it’s no surprise that Andrew indeed found the support of the man himself. Having the number one DJ supporting his tracks on the world famous A State of Trance radio show has ever been a dream of Andrew. And sometimes, dreams come true. His tracks ‘550 Senta’, ‘How Do I Know’ ft. Jano, ‘Aeon of Revenge’, ‘Aether’, ‘Deflagration’, ‘Musa’ and ‘Zeus’ all made it to the show, often voted Tune of the Week and Future Favourite. The trance scene embraced Andrew’s refreshing sound, giving him a very warm welcome. His tracks found a solid home on the A State of Trance and Armind labels, both part of the Armada Music family. Impressed by his originals, it didn’t take long until the Rayel sound became hot property for remixes. And so, Andrew was lucky enough to handle remix duties for tracks by Armin van Buuren, Markus Schulz, Tiësto, W&W, Bobina, Tenishia and many more. Earning the support of the DJ elite, the Rayel sound has spread all across the globe, from the underground clubs to the mainstream festivals.